Tires: better tires can give you significant traction and handling when you’re off road. That’s because they have better traction. They also will increase your clearance when you have bigger, beefer, taller tires. And because of the curvature they will be able to impact obstacles at a higher point on the circumference, which gives you better climbing ability over obstacles like rocks and logs in the trail. Also they look great so you’ll find yourself flying down the interstate with testosterone flowing through your veins just after pulling out of a tire shop. Lift: Of course it would be great if you got a lift. There are two ways you can get a lift with your truck. The first Is a body lift. You actually get in between the frame and the tub and you add space. This means the driver and passenger sit higher. The entire tub is lifted higher off the frame. Not a big improvement of off road performance because you don’t gain any clearance. The axles and the frame are all still at the same point and underneath there’s not much space added. You do get a little bit because you add in some space in the wheel well so it can be a cheap way to help add much bigger tires. The second way is a suspension lift. That’s higher, bigger shocks, bigger springs, which will allow you to lift the entire truck frame engine, all of that, higher off of the axles. The axles are still staying in the same place, but everything else has now been lifted. Specifically your breakover point spot in the middle underneath your truck. That will be higher giving you the ability to climb over and clear bigger obstacles. Axles: any good off road build will at some point evaluate the axles you have. Largely because you’re going to be pushing those bigger tires you need to make sure you keep spinning, but also because there’s ways to enhance your performance. So should you upgrade your axles, should you replace them all together? Two common upgrades are in the differential. 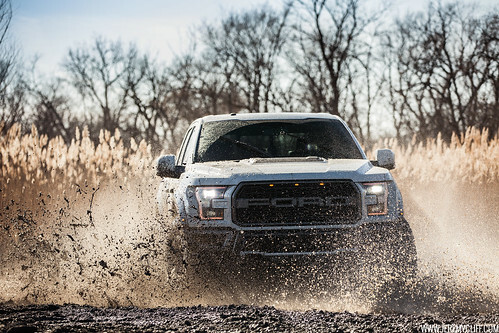 You can add lockers, which can greatly improve your traction off road you see essentially a four wheel drive vehicle is only two wheel drive with standard differentials. In the upgrade you improve your traction and performance of your truck. Also the gears inside the differential or set of gears need to be matched to the tire size you have and to your transmission to make sure that you’re gonna keep everything in sync and keep the engine running at optimal RPMs. Also it’s crucial that the gears in your front axle match the exact same ratios the gears in your rear axle. You have to keep all that together so any good build you need to evaluate do I keep these axles or do I need to upgrade? Another great upgrade is not what you do to the truck, but what you put in it. Make sure that when you go off road you’ve got a full set of tools and spares to help get you out of a tight spot. I got a parachute bag loaded with a bunch of stuff that I might need. Spare tire is obvious, but I’ve got a jack, I’ve got recovery gear and straps and shackles. I’ve got the jumper cables. I’ve got a bag just full of tools that I know work really well on my truck, the right sizes and stuff for most the common tasks. Spare fuses, I had a problem with a lot of fuses going out for awhile so I bought a whole bunch of them just to make sure I always had plenty. I got a gas can with a bunch of extra fuel in it. Stuff that’ll help make sure that if I get in trouble or if a friend on the trail gets in trouble I can help get them back to where they’re going. Another great upgrade is not to the truck at all and it’s not what you put in it, it’s the driver. If you know how to drive the truck well, what it’s limitations are, what your limitations are, and what it’s capable of you’ll be able to go a lot further safely and you know when you need to stop. I’ve seen people that have pretty basic stock vehicles do some amazing stuff. I’ve also seen people that have really tricked out rigs get stopped by some of the silly stuff just because they didn’t know how to properly drive for that obstacle. Spend some time learning how to do that. One quick tip, it’s pretty basic but when you’re driving off road the goal isn’t to have the big off road obstacles go right under the middle of your truck. The goal is actually to put your wheels on them. Your tires and drive up over them. That’s what the truck is designed to do. Lift you and everything up over that obstacle. That takes practice and know how to know what you can drive over and what you can’t, what’s too big, what’s not. Keeping your truck in peak off road performance is crucial by maintaining good maintenance. You don’t want spark plugs going out when you’re up on a pass somewhere deep in a trail. That’s not the time to find out the you should just change the oil or clean out your air filter. I want to mention a little bit more about you mechanic. Whether or not you’re comfortable working on your car there are always jobs that are best left to professionals. Let your mechanic handle jobs out of your comfort zone.